Home / Specialty / Plastics / Depth accuracy of the RealSense F200: Low-cost 4D facial imaging. TC ten Harkel, CM Speksnijder, F van der Heijden, CHG Beurskens, KJAO Ingels, TJJ Maal. Abstract: The RealSense F200 represents a new generation of economically viable 4-dimensional imaging (4D) systems for home use. However, its 3D geometric (depth) accuracy has not been clinically tested. 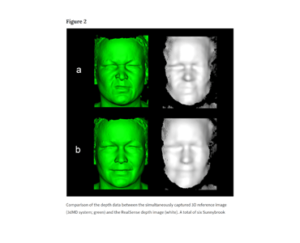 Therefore, this study determined the depth accuracy of the RealSense, in a cohort of patients with a unilateral facial palsy (n = 34), by using the clinically validated 3dMD system as a gold standard. The patients were simultaneously recorded with both systems, capturing six Sunnybrook poses. This study has shown that the RealSense depth accuracy was not affected by a facial palsy (1.48 ± 0.28 mm), compared to a healthy face (1.46 ± 0.26 mm). Furthermore, the Sunnybrook poses did not influence the RealSense depth accuracy (p = 0.76). However, the distance of the patients to the RealSense was shown to affect the accuracy of the system, where the highest depth accuracy of 1.07 mm was measured at a distance of 35 cm. Overall, this study has shown that the RealSense can provide reliable and accurate depth data when recording a range of facial movements. Therefore, when the portability, low-costs, and availability of the RealSense are taken into consideration, the camera is a viable option for 4D close range imaging in telehealth. Conclusions: The depth accuracy of the RealSense camera was determined by comparing the RealSense data to the 3D reference image from the two-pod 3dMD system. The reference image has a known accuracy of 0.2–0.25 mm when imaging the face at rest, which is considered as a sufficient accuracy for a range of clinical implementations26,27,28,29. Therefore, the RealSense would have a similar accuracy as the 3dMD system if the depth accuracy of the RealSense had been in the range of 0.25 mm. However, the RealSense is an order of magnitude more inaccurate, with an average accuracy of 1.48 mm for the healthy face at rest. This resulted in a smoother RealSense image compared to the 3D reference image (Fig. 2). Therefore, a decrease in accuracy at regions with a higher curvature, such as the mouth and nose, is expected and can be seen in Fig. 5. The inaccuracies around the nose region can partially be explained by the blocked view around the alar groove due to the frontal positioning of the RealSense, whereas the 3D reference image was captured by two pods from the side. Article: Depth accuracy of the RealSense F200: Low-cost 4D facial imaging. Authors: Timen C ten Harkel, Caroline M Speksnijder, Ferdinand van der Heijden, Carien HG Beurskens, Koen JAO Ingels, Thomas JJ Maal.